To create a custom menu, go to Appearance → Menus in your blog’s dashboard. Start by writing a name for your menu (e.g. Main Navigation) and click on the Create Menu button. On the right side all of your pages and categories will be listed and you can drag them to the center and start constructing your custom menu. In addition to that, you can use custom links for specific blog posts, external websites, images, etc. After adding your items, drag and drop to put them in the order you want. You can mix pages with categories and categories with custom links and so on. You can even nest items to create hierarchies on the navigation menu (just bear in mind that some themes may not support three or more level deep hierarchies). You can also click each item to reveal additional configuration options (change the navigation label, for example). 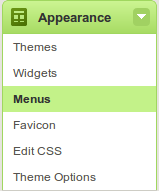 Be sure to click Save Menu each time you make changes to your custom menu.